Global Manager Group, leading ISO certification Consultancy Company has released ISO/IEC 17021:2011 documentation kit for Certifying bodies to help in quick Conformity Assessment documents. The ISO 17021 standard released in 2011 by ISO, with this document GMG becomes first organization which has prepared and provides such user friendly documents for ISO 17021 standard certification on web, to help certifying bodies worldwide to achieve conformity assessment in quick time. Mr. Devang Jhaveri, Director of Global Manager Group says ??? ?? ?This ISO 17021 documentation kit is introduced by GMG, prepared by team of expert ISO consultants to help certifying bodies for achieving ISO 17021 accreditation. As all other ISO documents are popular in ISO lead auditors as well as leading certifying bodies, we are very sure that they will like ISO 17021 document too.??? With releasing ISO 17021 documents, GMG has committed to share knowledge and experience in the field of ISO systems and certification worldwide. And make sure using GMG?? ?s ISO documents any organization can quickly completes documentation process for their ISO system certification. Global Manager Group has established user friendly document kit for ISO/IEC 17021:2011, Conformity assessment for Certifying Body in quick time. Global Manager Group has taken initiative and prepared the complete set of ISO 17021 documents, which includes ISO17021 manual, procedures, SOPs as well as policy and launching the document kit to help certifying bodies to update and accredit their system in quick time. The ISO 17021 total document written in plain English and it covers all the requirements of clauses and sub clauses defined in ISO/IEC 17021:2011 standard. 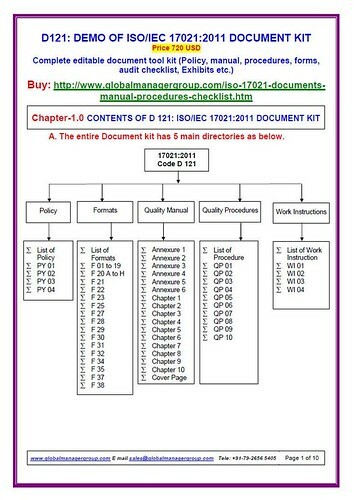 In the ISO 17021 document kit GMG provides quality manual, ISO 17021 procedures, SOPs – standard operating procedures, quality policy and work instructions, sample forms as well as ready to use templates in .doc formats. Read more about ISO 17021 Documents released by Global Manager Group.